London – February 5, 2018 – Today, world-renowned singer/songwriter Paul Simon announces he will perform at Manchester Arena on Tuesday 10th July as part of his ‘Homeward Bound’ Farewell Tour. that began in the early 1960s and has coincided with his artistic journey as a songwriter and recording artist until the present day. 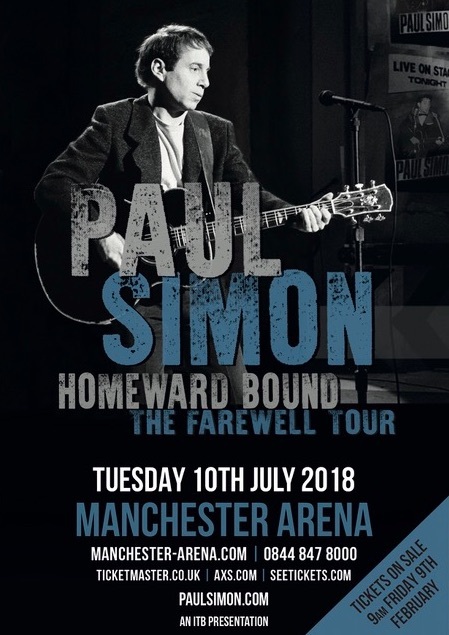 Having created a distinctive and beloved body of work that includes 13 studio albums, plus five studio albums as half of Simon & Garfunkel, Paul Simon is the recipient of 16 Grammy Awards, three of which—Bridge over Troubled Water, Still Crazy after All These Years, and Graceland—were Album of the Year honorees. In 2003, he received a Grammy Lifetime Achievement Award for his work in Simon & Garfunkel, and has sold more than 100 million records worldwide. During his unparalleled career, Simon has achieved 29 Top 40 singles in the U.S. alone, with 14 of those reaching the Top 10 or higher, including “50 Ways to Leave Your Lover” (which reached #1), “Kodachrome,” “Loves Me Like A Rock,” “Mother and Child Reunion,” “Late In The Evening,” “You Can Call Me Al” and many others. With Simon & Garfunkel, he wrote and performed the #1 singles, “The Sound of Silence,” “Mrs. Robinson,” “Bridge Over Troubled Water,” and numerous other timeless hits. Rock ‘n’ Roll Hall of Fame, both as a member of Simon & Garfunkel and as a solo artist. Simon was a recipient of the Kennedy Center Honors in 2002 and was named one of Time magazine’s “100 People Who Shape Our World” in 2006. In 2007, Simon was awarded the inaugural Library of Congress Gershwin Prize for Popular Song, which recognizes the profound and positive effect of popular music on the world’s culture. He was elected to the American Academy of Arts and Sciences in 2011. And in 2012, he was named the recipient of the prestigious Polar Music Prize along with classical cellist Yo-Yo Ma. Simon’s philanthropic work includes the co-founding of the Children’s Health Fund (CHF), which donates and staffs 53 mobile medical units that bring health care to low-income children and their families in urban and rural locations around the United States. Since its inception in 1987, CHF has provided more than 3 million doctor/patient visits.